If you’re a marketer considering a move from Drupal 7 to Drupal 8, it’s important to understand the implications of content migration. You’ve worked hard to create a stable of content that speaks to your audience and achieves business goals, and it’s crucial that the migration of all this content does not disrupt your site’s user experience or alienate your visitors. Content migrations are, in all honesty, fickle, challenging, and labor-intensive. The code that’s produced for migration is used once and discarded; the documentation to support them is generally never seen again after they’re done. So what’s the value in doing it at all? No matter what platform you’re working to migrate, your data is important. You’ve invested lots of time, money, and effort into producing content that speaks to your organization’s business needs. Migrating your content smoothly and efficiently is crucial for your site’s SEO ranking. If you fail to migrate highly trafficked content or to ensure that existing links direct readers to your content’s new home you will see visitor numbers plummet. Once you fall behind in SEO, it’s difficult to climb back up to a top spot, so taking content migration seriously from the get go is vital for your business’ visibility. Also, if you work in healthcare or government, some or all of your content may be legally mandated to be both publically available, and letter-for-letter accurate. You may also have to go through lengthy (read: expensive) legal reviews for every word of content on your sites to ensure compliance with an assortment of legal standards – HIPPA, Section 508 and WCAG accessibility, copyright and patent review, and more. Some industries also mandate access to content and services for people with Limited English Proficiency, which usually involves an additional level of editorial content review (See https://www.lep.gov/ for resources). At media organizations, it’s pretty simple – their content is their business! In short, your content is an business investment – one that should be leveraged. SO WHERE DO I START WITH A DRUPAL 8 MIGRATION? Like with anything, you start at the beginning. In this case that’s choosing the right digital technology partner to help you with your migration. Here’s a handy guide to help you choose the right vendor and start your relationship off on the right foot. Once you choose your digital partner content migration should start at the very beginning of the engagement. Content migration is one of the building blocks of a good platform transition. It’s not something that can be left for later – trust us on this one. It’s complicated, takes a lot of developer hours, and typically affects your both content strategy and your design. Done properly, the planning stages begin in the discovery phase of the project with your technology vendor, and work on migration usually continues well into the development phase, with an additional last-sprint push to get all the latest content moved over. While there are lots of factors to consider, they boil down to two questions: What content are we migrating, and how are we doing it? You may want to transition all of your content, but this is an area that does bear some discussion. We usually recommend a thorough content audit before embarking on any migration adventure. You can learn more about website content audits here. Since most migration happens at a code & database level, it’s possible to filter by virtually any facet of the content you like. The most common in our experience are date of creation, type of content, and categorization. While it might be tempting to cut off your site’s content to the most recent few articles, Chris Anderson’s 2004 Wired article, “The Long Tail” (https://www.wired.com/2004/10/tail/) observes that a number of business models make good use of old, infrequently used content. The value of the Long Tail to your business is most certainly something that’s worth considering. Obviously, the type of content to be migrated is pretty important as well. Most content management systems differentiate between different ‘content types’, each with their own uses and value. A good thorough analysis of the content model, and the uses to which each of these types has been and will be used, is invaluable here. There are actually two reasons for that. First, the analysis can be used to determine what content will be migrated, and how. Later, this analysis serves as the basis of the creation of those ‘content types’ in the destination site. 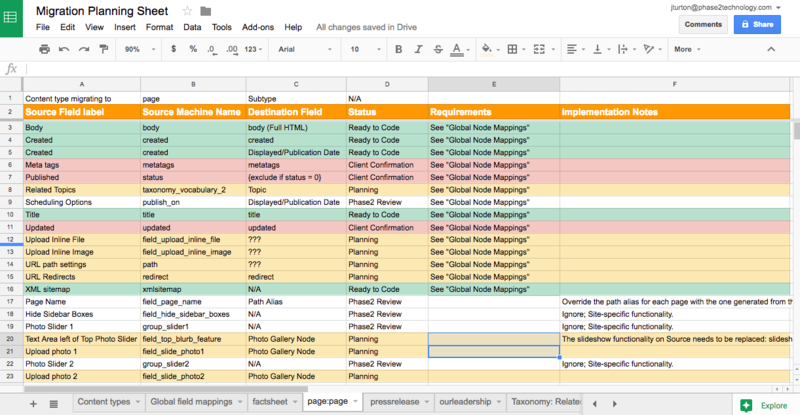 A typical analysis takes place in a spreadsheet (yay, spreadsheets!). 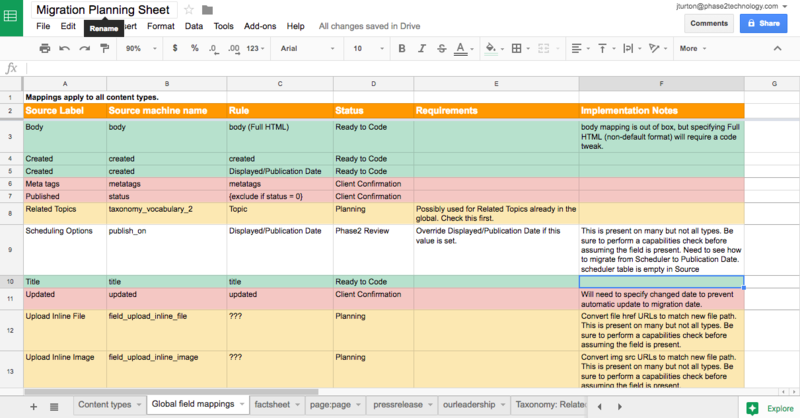 Our planning sheet has multiple tabs but the critical one in the early stages is Content Types. 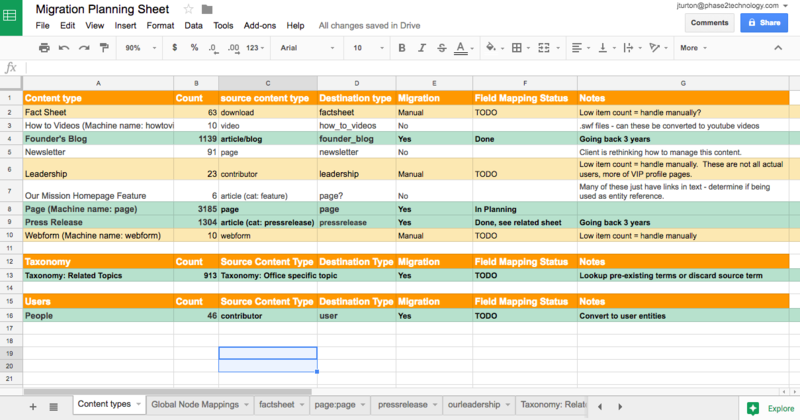 Here you see some key fields: Count, Migration, and Field Mapping Status. Count is the number of items of each content type. This is often used to determine if it’s more trouble than it’s worth to do an automated content migration, as opposed to a simple cut & paste job. As a very general guideline, if there are more than 50 items of content in a content type, then that content should probably be migrated with automation. Of course, the amount of fields in a content type can sway that as well. Once this determination is made, that info is stored in the Migration field. The Field Mapping Status Column is a status column for the use of developers, and reflects the current efforts to create the new content types, with all their fields. It’s a summary of the Content Type Specific tabs in the spreadsheet. More detail on this is below. Ultimately, the question of what content to migrate is a business question that should be answered in close consultation with your stakeholders. Like all such conversations, this will be most productive if your decisions are made based on hard data. This is, of course, an enormous question. Once you’ve decided what content you are going to migrate, you begin by taking stock of the content types you are dealing with. That’s where the next tabs in the spreadsheet come in. The first one you should tackle is the Global Field Mappings. Most content management systems define a set of default fields that are attached to all content types. In Drupal, for example, this includes title, created, updated, status, and body. Rather than waste effort documenting these on every content type, document them once and, through the magic of spreadsheet functions, print them out on the Content Type tabs. Generally, you want to note Name, Machine Name, Field Type, and any additional Requirements or Notes on implementation on these spreadsheets. It’s worth noting here that there are decisions to be made about what fields to migrate, just as you made decisions about what content types. Some data will simply be irrelevant or redundant in the new system, and may safely be ignored. In addition to content types, you also want to document any supporting data – most likely users and any categorization or taxonomy. For a smooth migration, you usually want to actually start the development with them. The last step we’ll cover in this post is content type creation. Having analyzed the structure of the data in the old system, it’s time to begin to recreate that structure in the new platform. For Drupal, this means creating new content type bundles, and making choices about the field types. New platforms, or new versions of platforms, often bring changes to field types, and some content will have to be adapted into new containers along the way. We’ll cover all that in a later post. Now, many systems have the ability to migrate content types, in addition to content. Personally, I recommend against using this capability. Unless your content model is extremely simple, the changes to a content type’s fields are usually pretty significant. You’re better off putting in some labor up front than trying to clean up a computer’s mess later. In our next post, we’ll address the foundations of Drupal content migrations – Migration Groups, and Taxonomy and User Migrations. Stay tuned!